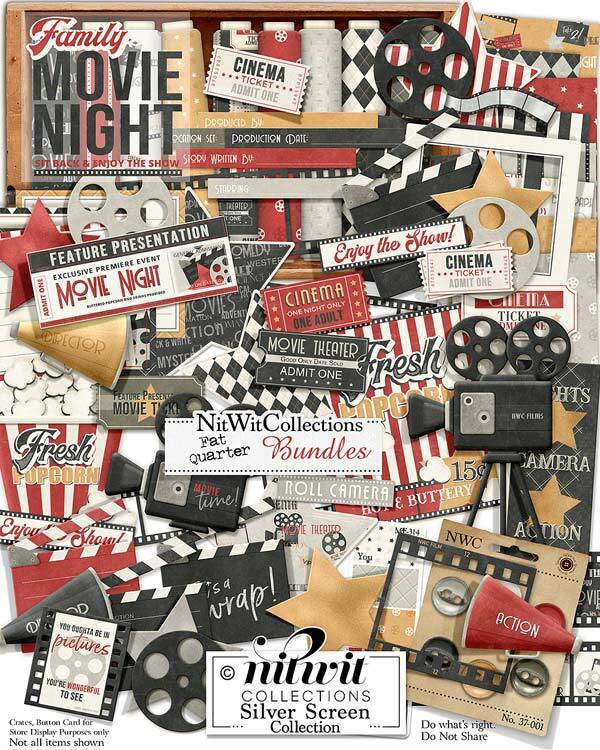 FQB "Silver Screen" Collection will make you a star when creating your scrapbook layouts, mini albums and cards! This vintage movie themed kit will have you creating like you're making a feature film. There are so many inspiring ways to use this Collection with all of the movie related elements that you'd want. Fabulous film strip frames, bullhorns and movie cameras fill this kit, not to mention the embellished labels, word art and of course, popcorn....where to begin?! Put yourself in the mindset that you're a star....and you will be! See each individual paper and element of this entire Collection on our Nitwit Collections YouTube Channel to get the full scoop!! 1 Clapper board - "That's a Wrap"
2 Clapper boards that are blank for you to fill in your details. Get creative....is your creation for a birthday, retirement, baby announcement, etc.?? 1 Single filmstrip frame....how about the perfect black and white photo?? 1 Label - "Lights, Camera, Action"
1 Filmstrip label - "You oughta be in Pictures...."
1 Digital stamp sentiment - "Family Movie Night...."
4 Stars that well embellished to coordinate with this digital kit. Which one suits your ideas? 1 Wordstrip - "Enjoy the Show!" 1 Wordstrip - "Roll Camera"
A digital scrapbooking kit and card making kit from Nitwit Collections. This product was added to our catalog on Thursday 11 October, 2018.